NEW YORK (WABC) -- The phenomenon known as "Manhattanhenge" made its official summer debut Sunday night, though clouds obscured the view. And unfortunately, you can expect the same result Monday. Manhattanhenge is created when the setting sun aligns with the city's street grid, creating a ray of light between the buildings. Sunset is 8:20 p.m. Monday, and if there's any clearing, the best spots to get a look are 14th, 23rd, 34th and 42nd streets. Manhattanhenge happens again in the middle of July. 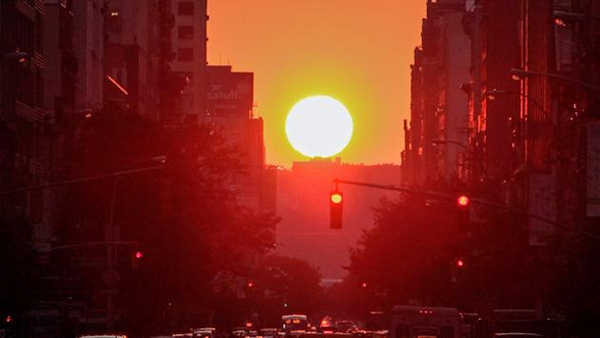 The term "Manhattanhenge" was coined by Museum of Natural History Hayden Planetarium Director Neil deGrasse Tyson.